The mystery of Stoker doesn't lead us to a climatic revealing point but dumps its revelation onto us as grisly as several of its gruesome murders. The setup is intriguing but the film is unbalanced by the self-indulgent gaze it holds over its perpetually stylised art design. A coming of age story and a family conspiracy of Hitchcockian proportions runs second to an arts show of strange and beautiful but thematically opaque imagery. The film is intriguing for the many reasons that hinder its script but it is also emotionally detached and its violence seems unnecessary, inconsequential and increasingly sadistic. Korean filmmaker Park Chan-wook is regularly intrigued by violence in films, having made the Vengeance trilogy, which included the hauntingly mysterious Oldboy. This is also the first film that Park has made in America and in English, courtesy of a first time script by Prison Break star Wentworth Miller. Miller has said that Hitchock's film Shadow of a Doubt was his inspiration for the film, which is fitting because Park cites Vertigo as the film that made him want to become a director. The disappointment then of calling the film insubstantial stems not only because of aspiring influences but the script's personal clout as part of the 2010 Hollywood Black List of the best unproduced screenplays. Perhaps a cultural division stopped the film from reaching the full potential because at times it evokes an outsider, looking at an American family inside a vacuum of time and space. Hitchcock's Shadow of a Doubt was about a man named Charlie who was on the run for ambiguous and sinister reasons and then attempted to hide within his own family. His relationship with his niece caused his motives to come unstuck. The premise is similar here. India Stoker (Mia Wasikowska) is an alarmingly remote girl, grieving from her father who has died in a car accident. 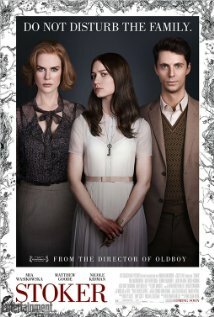 She has a brittle relationship with her mother Evelyn (Nicole Kidman) and becomes even more detached when her uncle Charlie (Matthew Goode), her father's brother, insists on staying at the house. Spying on her uncle, she notices that he and Evelyn are growing more intimate. This is in-between the brief arrival of Aunt Gwendolyn (Jacki Weaver). After Charlie begins to follow India, they being to grow closer together, leading to some violent actions against some kids bullying India. Chan-wook is a great visual stylist but his persistence to inject his stylistic imprint onto the film hinders the narrative. The film is gothic in both mood and form. The colouring is selectively muted, pushing clashing white and brown tones into the frame. The colour filtering inflicts a cold and immobile emotional state over India as she grieves. The conservative and low-key stylisation of her clothes also encapsulates her in a stasis of timelessness where she is not an adult but no longer a child. "To be adult is to be free," says her voice-over in the film's opening. The colour is conceivably a reflection of her inability to connect emotionally with people on an adult level and make choices for herself. It's Chan-wook's lingering camera and the specificity of the images that gets the better of him. The film is over-directed and heavy-handed. There are close-ups of shoes, pencils, blood and spiders crawling up India's leg and the sound effects of a clock are deliberately amplified. Combined with strange narrative details, like India receiving her birthday presents in a tree, the stylisation's purpose seems solely to impede rather than reveal the film's wafer thin plot until the final quarter. The narrative is maddeningly cryptic and light on insight, particular when the characters posses few signs of an inner life. Nicole Kidman's Evelyn has no backstory, which limits her panting, breathless performance to only fire late during a gripping monologue. Jackie Weaver's inclusion lack distinction, an underwritten role that is as brisk as the film's desire for murder. With a character that is intentionally disconnected Mia Wasikowska has a visible intensity inside her character, but India seems emotionally inexpressive. Her character's arc is an extension of brutal and violent horror than of psychological growth. The film suggests that her increasingly violent behaviour is equivalent to a sexual awakening, as shown through the juxtaposition of a shower scene with the flashback of a murder. In reality, the film is about a girl who breaks from her family to become a more violent individual against cartoon bullies from a bygone era, and then an undeserving final target. When the director cuts to a flower covered in blood at the end of the film I saw the blood but not the beauty or the growth.